This is the second in a string of posts on Small Business Travel Rewards programs. Definitely check out my post on United’s PerksPlus program if you fly United, Lufthansa, Austrian, Brussels, or Swiss. 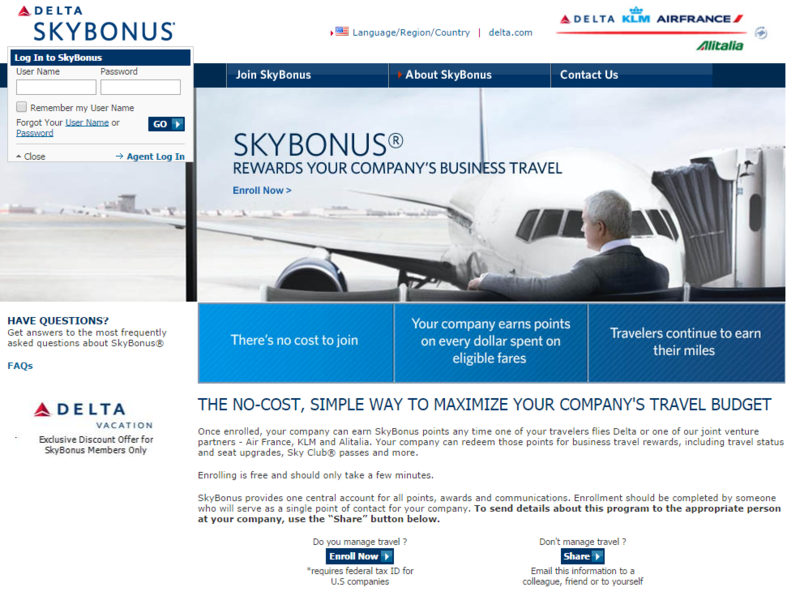 Delta’s SkyBonus program is designed as an enticement to small businesses (as well as travel managers) to bring more business to Delta Airlines, as well as their joint venture partners, Air France, KLM, and Alitalia. You earn points based on each dollar spent on Delta, Air France, KLM, and Alitalia. Unlike United’s PerksPlus, I can’t find any specific reference to “qualifying dollars,” however Delta states “eligible flight revenue” which is excludes taxes (full definition below). Here are the multipliers, note the specific eligible fare classes. Like United, Delta also rewards non-hub flyers more than hub flyers. Again, this is advantageous to fly from non-hub to non-hub over hub to hub like Atlanta to Salt Lake City. Award tickets in economy or business/first. You can check out the full redemption chart here, but I’ve summarized the options below. Like the United PerksPlus Program, these redemptions could be a nice opportunity for employers to gift employees with upgrades, low level status of Delta SkyClub membership. Now that you’re planning what redemptions look nice, here’s how you can qualify for the program. Small or Mid-size companies can participate if they spend a minimum of $5,000 USD in “eligible flight revenue” per calendar year. Delta doesn’t really call out “eligible flight revenue” like United, so far as I can tell the definition is buried in the terms and conditions, so be ware. The Company´s eligible flight revenue will be tracked by Delta and based on flown tickets. Eligible flight revenue is calculated using base fare (including any carrier imposed surcharges but net of all government imposed taxes and fees), prorated per flight segment, and rounded down to the nearest whole number. You can enroll here, with no fee, and will need to designate a “Program Administrator” to manage the account. The points expire on December 31st, 3 years from earning. What it boils down to is that anytime you can leverage complimentary programs, such as this Small Business Travel Rewards program, you can generate greater value from travel that was (most likely) already going to happen. Last year many of us that had gotten 50k sign-up bonuses had our points terminated at year-end for not meeting the $5,000 spend. No notice whatsoever. I escalated within Delta and they were nasty, insisting we all were contacted and someone all mysteriously overlooked the email. Account was reopened but points not reinstated. Ouch! I remembered hearing about accounts being emptied out, but I hadn’t realized it was that substantial in losses. You’d think folks trying to make Delta the preferred airline for a company would be kinder and more accommodating… Maybe a lesson to go elsewhere? And that was the treatment I got from escalating to senior Delta people despite being DM since they launched and over $30k MQDs in my day job last year. Cool, I will have to look into this further, thanks Alina!